Philip Charles Alexander Usher was born in Trowbridge, Wiltshire on March 18th 1899 and attended Christ Church, Oxford in 1919. After he was ordained he was appointed Domestic Chaplain to the Bishop of Gloucester, The Rt Rev'd Arthur Headlam, during which time he developed an enthusiasm for and devotion to ecumenism - something that he would retain for the rest of his life. In 1924 he became Chaplain of St George's Church in Jerusalem, then in 1928 became a Chaplain in Athens in service of the city's British community. He was very keen to understand the 'abc of Greek life' and could converse fluently in the local vernacular with people of 'every class, occupation and type of culture'. He became a source of great knowledge for this part of the world and for the Orthodox Church in general. After returning to England in 1930 he once again became Chaplain to the Bishop of Gloucester, who would feature prominently in the Church of England's Council on Foreign Relations. He chaired the Committee on Relations with Episcopal Churches. Usher became an honorary secretary to the Council on Foreign Relations in 1932, shortly before being made Warden at Liddon House. Liddon House, now the Liddon Fund and part of the Society of the Faith, was set up in 1906 by two brothers, the Revd Canon J A Douglas and the Revd C E Douglas, with the object of creating "an Association of Christians in communion with the See of Canterbury for mutual assistance in the work of Christ’s Church and for the furtherance of such charitable undertakings as may from time to time be decided upon, more especially for the popularisation of the Catholic faith." The Douglas brothers had travelled in the Near East and were ahead of their time in having an interest in the Eastern Churches. As a result the Society had a role in the foundation of the Catholic Literature Association and the Anglican and Eastern Orthodox Churches Association. It also supported the Nikaean Club and provided grants for visiting Orthodox theological students. Many Orthodox clergy would stay at Liddon House whilst visiting London and Usher took part in several trips to the Orthodox regions, often leading large Anglican delegations including to Romania in 1935 and Bulgaria in 1940. He was made Chaplain at the Grosvenor Chapel, South Audley Street in London in 1937. After war broke out in 1939 he worked for the Interior Ministry, advising on the Eastern regions. 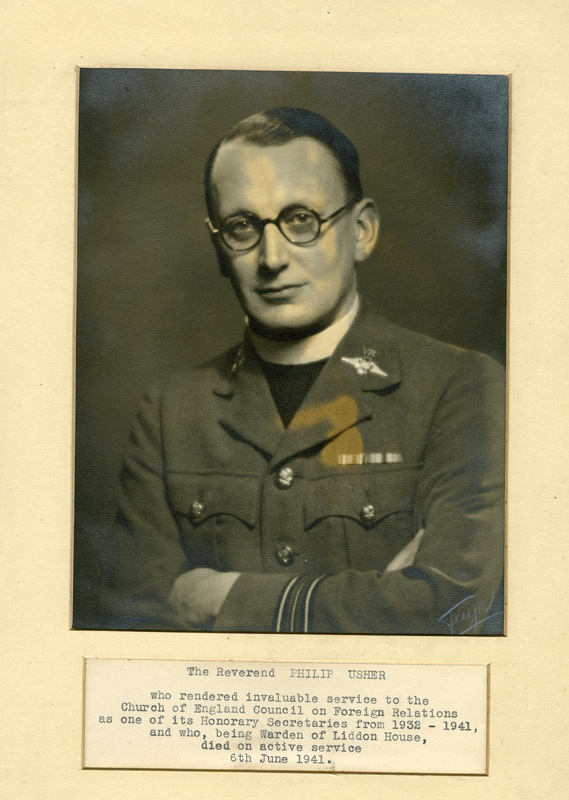 However, having become 'increasingly dissatisfied with staying at home' he joined the Royal Air Force Volunteer Reserve as a Chaplain and was sent to Palestine, where his in-depth knowledge and understanding were considered useful. He died on active service near Jerusalem on June 6th, 1941, and is buried in the Ramleh War Cemetery Plot P 1, also near Jerusalem. The Philip Usher Memorial Fund was set up in his memory to 'give others an opportunity of living in an Orthodox country in order to absorb its ideological atmosphere'. Information above drawn from letters held at Lambeth Palace Archive.